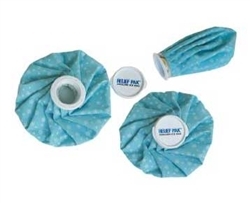 English Style Ice Cap by Fabrication Enterprises from Incontinence Products Plus are 9” general purpose ice caps for cold therapy pain relief. These reusable ice Caps are made of a rubberized fabric and have an aluminum screw cap. Simply fill the ice cap with ice, close lid and apply to location desired for cold therapy.